In December of 2015, the Zumwalt headed out into the frigid North Atlantic on sea trials (essentially testing the abilities and reliability of the ship.) Although not part of the scheduled testing, the ship responded to a nearby US Coast Guard call for assistance (to aid a fishing boat in distress.) The Coast Guard, unable to discern the Zumwalt’s exact location on radar, radioed the destroyer for her coordinates again. 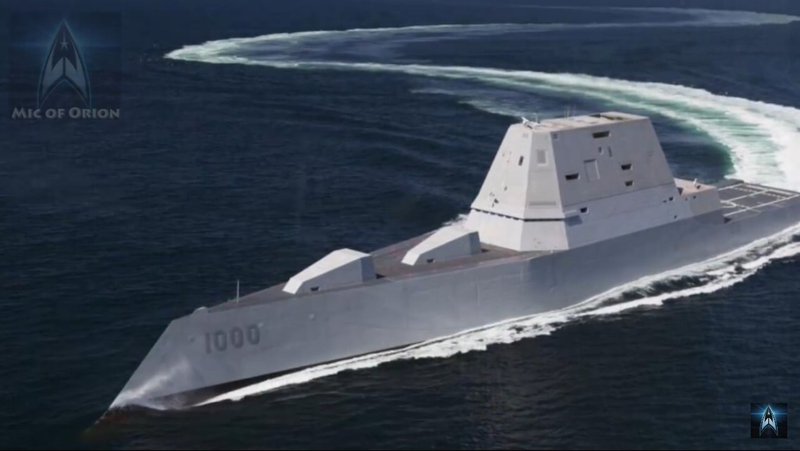 It became apparent that the Zumwalt’s stealth capabilities were in full effect; the 600 foot long ship’s radar signature was returning as if it was a 22-foot fishing vessel! The ability to be more than what’s apparent at first glance isn’t limited to cutting edge stealth warships. It happens in fantasy football all the time; LeGarrette Blount seemed to be a borderline replacement level talent until he set career highs in carries, yards, and touchdowns for the Patriots in 2016. (If you happened to snag Blount in the 17th round last year, you landed the RB9 for less than the price of Keyarris Garrett.) The trick is identifying the players who appear mundane but are primed to outperform their draft position, while culling out the ones who have been inflated by anecdotal evidence, perception, and hope. Ameer Abdullah is a player with a fairly substantial radar-signature. Just two short years ago, Abdullah appeared poised to slice through the NFC North. As a 2nd round rookie in 2015, fresh off a 1,600 yard senior season at Nebraska, he hit the ground running; Abdullah took seven touches and parlayed them into 67 yards his first ever preseason game in a Lions uniform. From that moment, it was apparent that Abdullah was at the forefront of Detroit’s plan for the ground-game. I’m not sold. When talking about Ameer Abdullah, you first have to give him credit for what he is: an average between the tackles runner with exceptional short area quickness (98th percentile Burst Score and Agility Score on PlayerProfiler.) But the real draw is Abdullah’s ability as a receiver out of the backfield; he caught at least 22 passes in each of his last three years in college and 25 in his full season as a professional. That’s a nice hole card to be able to play. The problem lies, not with Abdullah however, but with the situation in Detroit. Being the lead running back on the Lions is kind of like being the best looking girl in a shipyard beauty contest; it’s not saying much. Over the last three seasons, Detroit has finished 25th, 30th, and 32nd in rushing attempts in the NFL. If that’s not enough to temper your expectations of Abdullah, let’s turn our attention to the receiving game for a moment. Theo Riddick is arguably the best pass catching back in the NFL. (I’ll acquiesce if you want to argue D.J. or Le’veon Bell, but after those two, there’s not even a conversation.) In Ameer Abdullah’s exciting rookie season, Riddick quietly amassed 80 receptions on route to being the RB18 in ppr formats. (Abdullah finished as RB44.) Last season, battling injury, Riddick finished as the RB25. Riddick IS the pass catching back in Detroit, whether Abdullah is there or not. Even if you decide to up Ameer Abdullah’s workload this year to 65% of Detroit’s carries, his line should look something like 985 yards and 5 touchdowns. Sprinkle in 22 catches for 150 yards plus another score and Abdullah is clinging to RB2 status with 172 points in a ppr format. (For reference, that would have put him firmly between Jeremy Hill and Terrence West last season.) Luckily, there’s a stealth option. Although lately there is some buzz building around Ty Montgomery, he is still largely under the radar (71st overall in DLF’s June ADP.) A convert to the running back position, Montgomery performed more than admirably when pressed into starting duty in six games during the 2016 season. (Montgomery averaged 64 rushing yards per game as a starter, 12 more per contest than Abdullah posted in his 6 starts in 2015.) There is obviously a learning curve when switching positions at the highest level of the game, but it would appear that Montgomery was able to adjust on the fly. When I size up a running back in a fantasy context, one of the first traits I look for is the ability to receive. 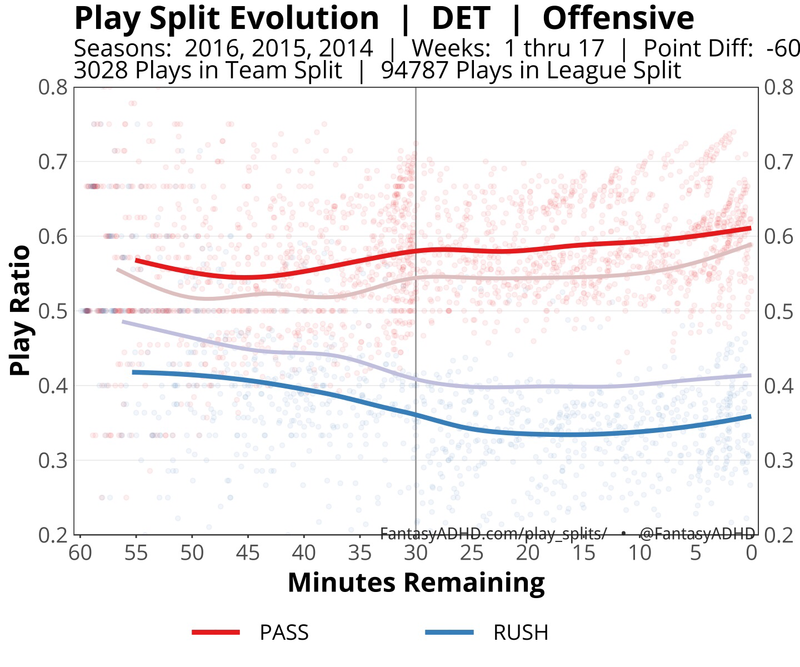 (The value of a pure runner has steadily declined as NFL teams have shifted toward short passes to efficiently move the ball down the field.) That’s not to say that there aren’t “pure runners” who are successful, but the high end fantasy backs are most often the ones deployed heavily in the passing game. (David Johnson, Le’veon Bell, Devonta Freeman, Demarco Murray, LeSean McCoy, Todd Gurley, Melvin Gordon, and Isaiah Crowell each caught 40 or more balls last season.) In a ppr format that handily rewards receivers, it makes sense that pass catching running back are inherently more valuable. Montgomery’s receiving pedigree is a definite check mark in his favor. Because Ty Montgomery was drafted out of Stanford as a receiver, an overused (and frankly unwarranted) narrative is that he is an undersized pass catching back. This couldn’t be further from the truth. In reality, Montgomery stands six feet tall and weighs in a shade over 215 pounds; although there are rumors that he’s actually bulked up during the offseason. At any rate, he has the requisite size and speed (4.55 forty yard dash) to be a starting running back in the NFL. There are risks involved in any player drafted in the sixth round or later, and Montgomery is no different. The immediate concern is that he’s never been a lead back before, and the time he has spent in Green Bay’s backfield has been severely limited. (In fact, the most carries Ty Montgomery has seen in a single game is 16, and that game, versus Chicago, is his only time with double-digit rushes.) Add in the fact that the Packers as a team finished 30th in rush attempts in 2016, and Montgomery’s warts begin to surface. Further clouding Montgomery’s future is the Packers’ 2017 draft class, which included a pair of 4th round rookie runners, Jamaal Williams and Aaron Jones. While all these things are true, they may not be as damning as they appear on the surface. Green Bay’s move to add talent to a depleted backfield can be partially explained by the departures of Eddie Lacy, James Starks, and Christine Michael who collectively accounted for 44% of Green Bay’s touches last season. The Packers needed to refill the roster behind Montgomery, and Jones and Williams are talented, young backs. (The Seahawks took a similar tack in the 2016 draft after losing Lynch, Fred Jackson, and injury to Rawls.) I see the Packers’ rookies as insurance against a worst case scenario and a change of pace to spell Montgomery; while I do think he can be a lead back, I’m realistic enough to understand that 300 carries are probably not in TyMont’s future. The dearth of carries in 2016 can be explained away just as easily; Montgomery was not in the plans last season. Nor was the collapse of Eddie Lacy or the concussion issues that plagued James Starks. In fact, the Packers were caught so off guard by the events of 2016 that the fullback position saw a nearly 400% increase in carries, Christine Michael was signed as a stopgap, slot receiver Randall Cobb saw work out of the backfield, and finally, Ty Montgomery was converted full time to running back. All of this flux caused Green Bay’s coaching staff to drastically reshape their strategy. Instead of continuing to be In the top half of rushing teams, (12th in attempts in both 2014 and 2015,) the Packers slashed their rush attempts by nearly 75 and put the ball in Aaron Rodgers’s competent hands. After an entire offseason to get comfortable with Montgomery as the lead back, I envision the Packers returning to a run game featuring in the vicinity of 425 rushes. It’s easy to see a 45% share for TyMont this season. The last issue has to do with questioning Montgomery himself; can he be a lead back? Well, we saw Montgomery step in and fill the starting job for 6 games in 2016. While it wasn’t alway pretty, he managed 64 yards per game (which works out to be a little over 1000 yards across a full season.) Now, I’m not advocating that Montgomery will be a thousand yard rusher, but his performance last year does go quite a way toward allaying fears about his ability to be effective. Having Aaron Rodgers under center doesn’t hurt either; last season, Montgomery saw specialty defensive packages, (more defensive backs to combat the threat of the pass,) in nearly 90% of his rushes. When you total up the score on Montgomery, he comes out ahead. In the end, he is a pass-catching lead back in a prolific offense. With a full offseason to focus on being a running back, I think Ty Montgomery flourishes in his new role to the tune of 900 yards and 3 touchdowns on the ground to go with 50 catches for 400 yards and another 2 scores. That production would land Montgomery firmly in mid-to-high end RB2 territory. 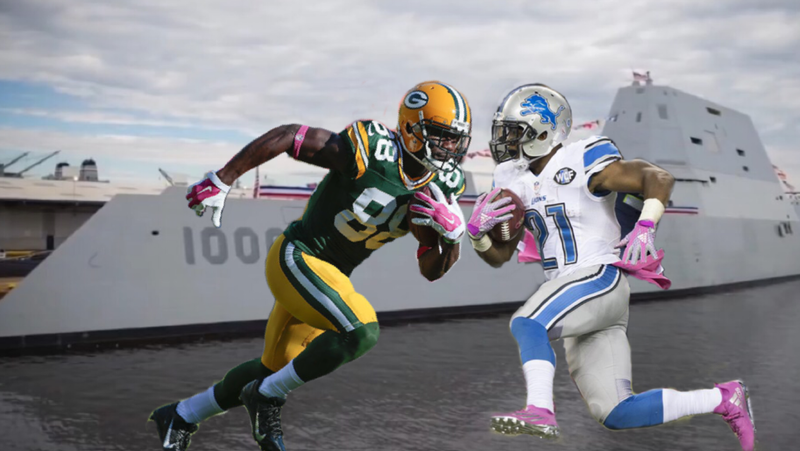 I love the receiving capabilities of both Ameer Abdullah and Ty Montgomery; it’s a facet of their respective games that adds value to both an NFL team and your dynasty roster. Both are excellent candidates to provide RB2 scoring, but ultimately I’m going with the lead back in an offense tied to Aaron Rodgers. Snag Ty Montgomery now, while he’s still slipping by under the radar.